What if you could explore the impacts of everything you’ve ever done along with everything you’ve never done? 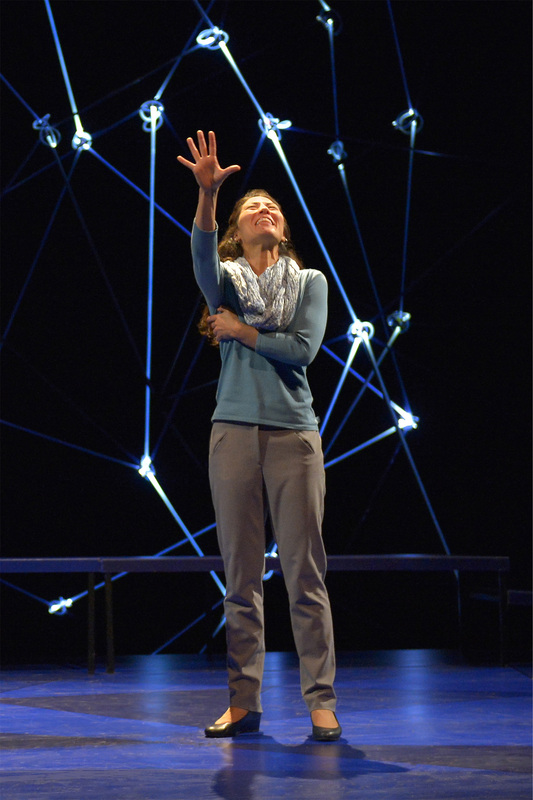 Constellations (written by Nick Payne and currently on stage at TheatreWorks) combines the science surrounding the concept of the multiverse (i.e., multiple universes existing simultaneously) through the lives of two people who meet by chance, fall in love, and live out their lives together; or maybe they don’t. Director Robert Kelley has been haunted by this play ever since he first read it. At first glance, it struck him as “contemporary science run wild” given its theme of the multiverse. 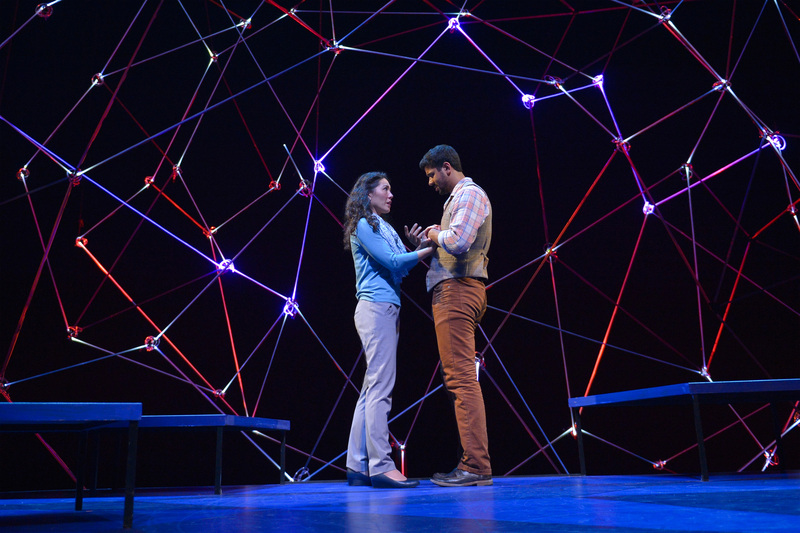 Upon reflection (and subsequent readings) the play’s handling of the complexities of timing in life and how even minute changes in choices could result in an entirely different life path intrigued him and drew him to bringing this play to TheatreWorks. Kelley’s cast includes Robert Gilbert as Roland and Carie Kawa as Marianne in this TheatreWorks Regional Premiere. They are memorable in these roles as their characters inhabit constantly shifting realities. The story takes place in England, and the time is fungible. As the program points out, “we have all the time we’ve always had.” Marianne is a professor of physics and cosmology at Sussex University, and Roland is a beekeeper – an unlikely pair in any universe. They meet at a BBQ (under various circumstances), and numerous iterations of what their lives might be play out. The script’s written format is somewhat different than a standard play given there are no scene numbers and very few stage directions evident. Instead, the playwright includes the instruction “an indented rule indicates a change in universe” on the otherwise blank facing page at the beginning of the script. The rule he mentions is an indented, solid horizontal line separating text meant to take place in different universes. As the action crosses each of these lines, Kelley’s artful direction includes subtle changes in blocking, mannerisms, and even his actors’ vocal cadences to move smoothly from one reality to another. Andrea Bechert’s scenic design is gorgeous and somewhat otherworldly. A large, geometric lattice of rods and vertices takes up the bulk of the upstage space. The structure evokes a planetarium display. The lattice works in conjunction with Steven B. Mannshardt’s lighting design, with different light patterns and colors through the lattice helping to define the emotion and identification of a particular universe within the multiverse. The shifts between universes are accompanied by momentary blackouts and by Cliff Caruthers’ compositions and sounds. 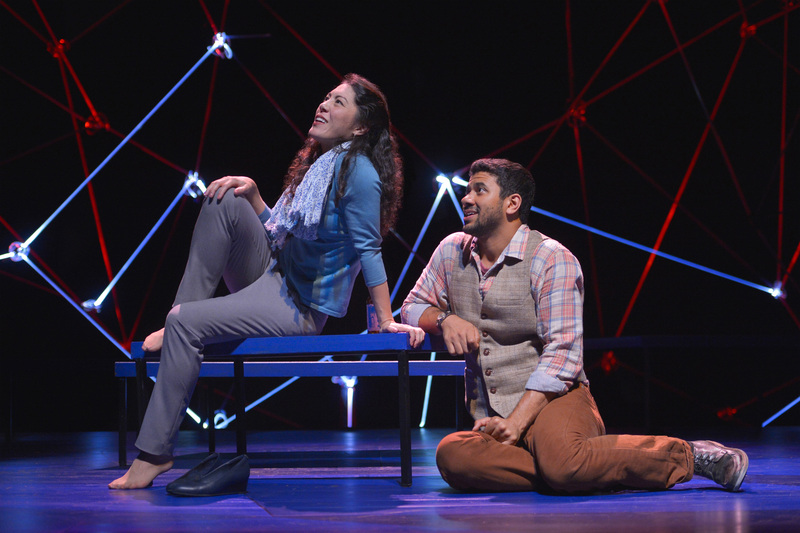 The synthesized music keeps the planetarium feel very much alive throughout the play, even though the locations are not actually inside a planetarium at all. The locales are far more mundane than that, but they are only abstractly represented through the discourse and a few movable benches that become various furnishings when required. The presentation has a lot of emotion, and Payne’s prose is laced with humor as well as pathos. 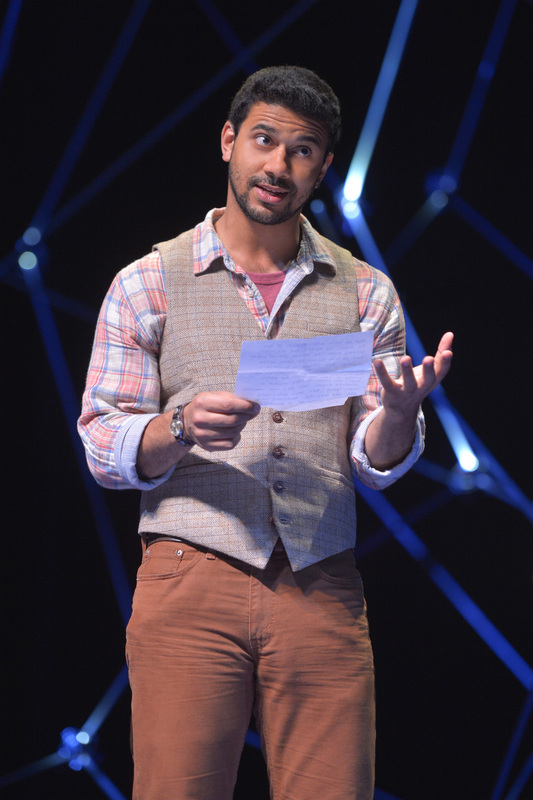 Along the way, through surprisingly accessible sequences, the audience learns a bit about string theory and the multiverse as well as beekeeping. Each character gets to explain their area of expertise to the other. In keeping with the script’s setting, both actors play English characters which for Gilbert takes advantage of his native accent. Kawa does an admirable job of adopting a convincing accent, though her more American speech pattern momentarily breaks through in a couple of places. Their rapport is extremely believable, even though some of the scenes are very short. Both of these characters remain affable, though their actions in a given universe might sometimes be less than honorable. There is still a vulnerability about them both. Because the scenes move quickly from universe to universe, various segments of the story are told multiple times, frequently in rapid succession, and occasionally asynchronously, often with only minor variations. Beyond blocking changes, these shifts can be as small as a single word difference, or even just a slight alteration in a look or inflection. Both actors adroitly navigate these often abrupt emotional transitions. This 70 minute presentation will fly by (though audience members might very well lose track of time while in the multiverse of the story). The play is pleasantly cerebral, and it’s quite possible to leave the theater contemplating the vast “what ifs” of one’s own life. See http://theatreworks.org/201718-season/201718-season/constellations/, email boxoffice@theatreworks.org, or call (650)463-1960 for more information or to order tickets.